After I'd spent a busy week with David, experiencing mustering and weaner educating, I joined other livestock and dog handlers who had converged on Riverside in central Queensland for a 3-day Fairdinkum Livestock Handling Clinic. The crew from Riverside: Charles, Claire, Holly, Hayden and Lachlan were joined by Jack, Clinton, Richard, Dan, Nat and myself to learn the finer points of livestock handling from David Hart. Fig 1. Handler directing the human dogs. Fig 2. Letting weaners into the main yard. Fig 3. Part of David's 'A' team: Comet, Rock, Chief and Gold. Fig 4. Charles and Choco. Charles's aim for the clinic was to get another group of weaners educated—he was already well educated in the process and proved to be a great coach for the rest of us during the practical activites. Lachlan, who is at Riverside to fill in while David is on his "European tour", had also been working with David in the previous few weeks and also proved a worthy tutor. 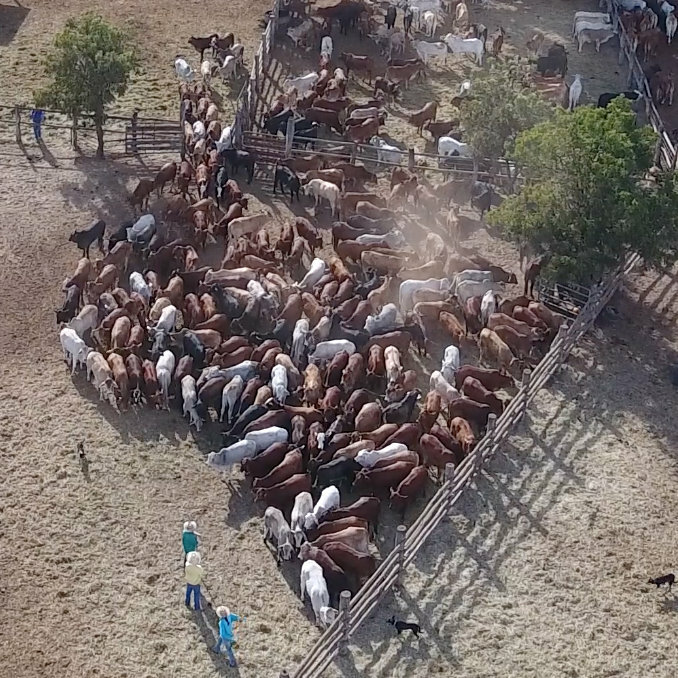 The rest of us were hoping to find new and better ways to handle the cattle and get the best from our dogs, and we weren't disappointed. The clinic revolved around educating about 350 Riverside weaners during which we learned and applied all the principles of good stock handling and how to use dogs to assist the process. The first highlight was learning the art of reading the stock and finding the right position—3 participants worked the cattle in a figure 8, with one being the leader/handler and the other two people were "natural dogs", who needed to find the right position to get the cattle round the drums. The next step allowed the handler to drive the cattle round the figure 8, but to also direct the "human dogs" into position (see Fig 1). On our second day we worked the dogs with the weaners before taking each group through the force pens and race. On our third day, using more dogs than can be found at a pound (well, they all had to have an opportunity! ), the weaners were let out to graze under the supervision and guidance of the newly trained handlers and dogs. The mob wheeled and dust flew as the youthful exuberance of the newly started dogs was brought under control, but the more experienced dogs brought turned the mob in the right direction and allowed them to find relief grazing the foot-high buffel, before being brought back to the yards. David has asked me to write a summary of all the principles and it is available here. The video below shows David demonstrating how the dogs are used to "shorten the yard".